Statins are among the most widely used medicines in cardiovascular pharmacology. Also known as HMG-CoA reductase inhibitors, statins have been around since 1987. Then, it was lovastatin that was first marketed but many more have since been developed. Lovastatin is a naturally occurring statin found in small quantities in foods such as oyster mushrooms and red yeast rice. Some earlier statins, such as cerivastatin, were withdrawn from the market (2001) due to the risk of fatal rhabdomyolysis. Primary prevention – statins are used to reduce the risk from serious cardiovascular events, such as heart attack and stroke, in patients over the age of 40 who present with a real and significant long-term risk. Secondary prevention – statins help reduce the risk of additional cardiovascular events in patients with pre-existing cardiovascular disease. Hyperlipidemia – statins are used to reduce harmful levels of cholesterol in the bloodstream. Elevated levels of cholesterol are linked to cardiovascular disease. Statins work to lower harmful LDL cholesterol and reduce the long-term risk of heart attack and stroke. Statins are HMG-CoA reductase inhibitors. HMG-CoA reductase is an enzyme; the rate-limiting enzyme in the mevalonate pathway. Mevalonate is part of an enzyme cascade that leads to cholesterol synthesis. By competitively inhibiting the rate-limiting enzyme, statins reduce LDL levels in the blood. It’s worth noting that statins reduce cholesterol production in the liver. Most circulating cholesterol does not come from the liver but rather from internal physiological processes. When statins reduce hepatic cholesterol production, blood cholesterol levels fall. Hepatic cells upregulate production of LDL receptors to extract cholesterol from the blood circulation. As low-density and very-low-density lipoproteins (“bad cholesterol”) pass by these receptors, they are extracted and ultimately converted to bile acids and other byproducts. Of course, statins do more than just reduce LDL cholesterol. Studies consistently show that statins also contribute toward enhanced endothelial performance, regulation of inflammatory processes that otherwise lead to atheroma formation and maintaining plaque stability and reducing the risk of blood clot formation. Via these mechanisms, HMG-CoA reductase inhibitors prove effective in the treatment of both primary and secondary prevention of cardiovascular disease and hyperlipidemia. What does statins pharmacology say about their side effect profile? Statins are generally very well tolerated. However, they do come with their own risks. Below, we review both common and serious side effects that are linked to statins. Muscle pain – approximately 1-in-10 patients taking a statin experience muscle pain. A much smaller minority experience inflammation of muscle cells and, even more rarely, some experience rhabdomyolysis – a condition in which muscle cells break down and eventually lead to kidney failure. Diabetes – there is more than tentative evidence that statins and diabetes are linked. As statins inhibit the enzyme HMG-CoA reductase, it also inhibits other elements involved in the process – including coenzyme Q10; an enzyme that plays a role in glucose regulation. Elevated liver enzymes – a relatively frequent side effect. Usually, alanine transaminase levels are elevated (not exclusive to this enzyme, though). Other medicines can increase / decrease the incidence of these side effects, examples of which we explore below. That statins should be used with caution in patients with hepatic impairment. That because statins are excreted via the kidneys, doses should be reduced in patients with renal dysfunction. That other drugs – such as gemfibrozil – increase, when taken with statins, the risk of rhabdomyolysis. Gemfibrozil is a fibrate that also lowers cholesterol levels. That statins are category X – meaning they are contraindicated; not least because cholesterol synthesis is essential for fetal formation. Statins with a short half-life – such as simvastatin, lovastatin and fluvastatin – are often advised to be taken in the evening, where endogenous cholesterol synthesis is at its highest. Grapefruit juice elevates plasma concentration of certain statins – for example, atorvastatin, simvastatin and lovastatin (metabolized by CYP3A4, whereas fluvastatin and rosuvastatin are metabolized by CYP2C9). HMG-CoA reductase inhibitors are well-tolerated drugs that continue to play an important role in reducing cardiovascular disease in an era where that same disease continues to grow year on year. 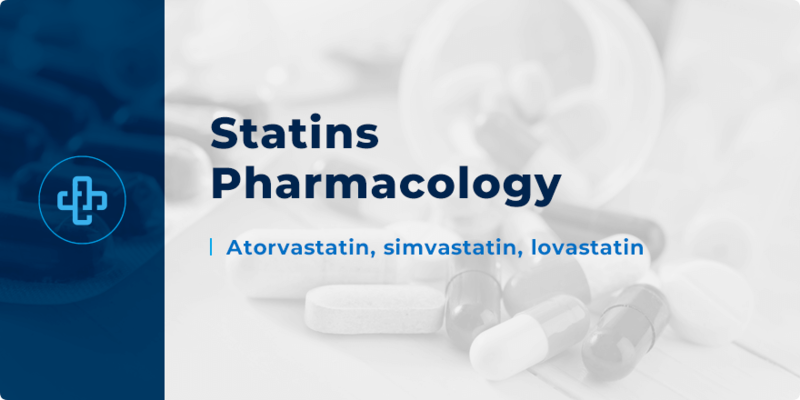 Want to test your knowledge of statins pharmacology? Register with PharmaFactz today to receive instant access to our resources. In the meantime, take a few seconds to join our newsletter (above) to receive all the latest facts direct to your email!